Hygiene products are an excellent choice for promotional purposes because cleanliness is important to all. Giving out promotional hygiene products will encourage your clients and business partners to take time to care for themselves. Look around in our online store and find the ideal advertising gift for your customers and business partners. 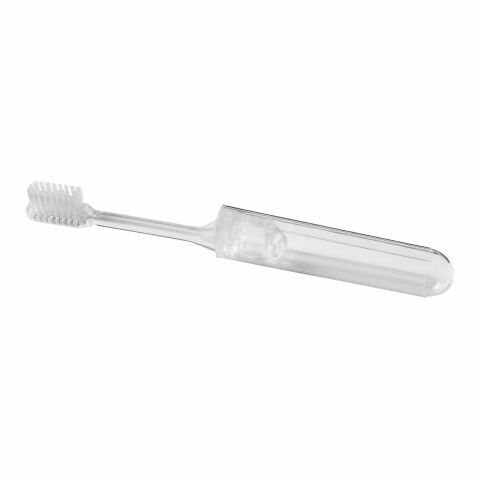 Next to lip balms we also offer hand and nail tools as well as bath tools and toothbrushes. These would be ideal as personalised products in hotels or spas. Our bathroom set in particular would make a brilliant premium gift! At allbranded you will definitely find the perfect promotional products to fit your marketing aims. Hygienic merchandise is great for a wide range of businesses. Gyms can place them strategically in their changing rooms creating a better customer experience and clean atmosphere. Travel agencies could give them to potential clients to come in handy on the future trips they are soon to book through them. Schools or hospitals could give the items to pupils/patients to help keep them healthy and encourage cleanliness. Spas could even include the freebies as part of their package, encourage visitors to take them home and let friends and family know about how lovely a time they had there. As you can see, the uses of such products really is endless! Printed beauty, cosmetic and wellness products can be hyper relevant to your industry and be tailor made to promote whatever message you are trying to communicate! They can work well with your other advertising campaigns and do not come at a very high price. Now more than ever, it has become trendy and essential to be well groomed. In life there are many occasions where it is particularly important to be well presented, birthdays, weddings and job interviews are just some examples. The grooming tools in this section will allow your clients to leave a good impression on all who come into contact with them. These products are also practical, which ensures people will be using them for many years to come. By extension, this also means that they will be exposed to your brand on a daily basis. One of our favourite hyiencic printed products has to be the promotional lip balm. It is small enough to fit in the pocket and be carried around all day but offers a large enough printing area that those around the recipeient will be sure to notice your logo and become aware of your brand as a result. For a slightly larger, more attention grabbing product we suggest promotional candles! They exude quality and sophistication, making anyone that you gift them to feel valuable and appreciated. It is easy to see how these corporate gifts can be so effective. In the online store, we offer different hygiene products to help your customers look and feel their best. The bathroom set is the most premium set on offer here. It consists of a rustic looking wooden bucket, which is then filled with a pumice stone a nail brush and a loofa. This would be appreciated by anyone who received it, and would make the ideal giveaway for business partners and hard working employees. There are also wet tissues, which are a practical travel item for anyone, but would be particularly useful at festivals, on flights or road trips. No matter what your marketing goals, there is sure to be a product here to help you achieve it. Distribute hygiene products at events and exhibitions, and people will be intrigued by your more unconventional advertising methods. Whilst your competitors are giving out pens and mugs, you will be remembered for being different. Every time your customers go to brush their teeth with your promotional toothbrush, they will be faced with your branding, your business will be inside the heads of your customers and business partners! Promotional hygiene products by allbranded are useful and stylish, which is the best combination for the most effective personalised products. It doesn’t matter what kind of promotional products you choose, all of the ones featured here will have a strong impact and a long lasting advertising effect. These items will also be more memorable than the classic pen or t-shirt that most companies are handing out. If you’re unsure of where to begin, or have any questions about the design process, please don’t hesitate to give our friendly team a call. Alternatively, you could use the live chat function at the bottom of the page.